It’s harvest time! Fresh organic apples are abundant in the fall. Each apple tree produces fruit only once per year. Harvest time here is between August and October…one of the best times of the year (along with blossom season). An entire year’s worth of apples are harvested during this abundant time of the year! Orchards all around the valley are opening up for farm tours and u-pick harvesting. There is something magical about the crisp fall air and abundance of fresh food at this time of year. Start with a farm tour and harvest your own apples for the winter. Then cozy up for a nice apple pie or warm cinnamon cider. You might just be convinced to plant a few of your own apple trees! Or are you in USDA zones 4-8? Have you noticed apple trees in neighbours yards? If so, you can consider planting your own mini-orchard. Growing your own organic apples is a bit of an exercise in patience, but the effort is rewarded sweetly each fall. If you do decide to plant your own apple trees, you’re in luck! Fall is the perfect time to plant new trees. Not only are trees generally reasonably-priced in the fall, they also are headed into winter dormancy. After they’ve produced fruit all summer, fruit trees get a break in the fall and winter seasons. Planting trees in the fall will ensure they don’t have to endure the stresses of the hot sun and parched soil, nor the burden of producing fruit. Newly-planted trees can cozy up in their new homes for the winter. Your new trees will be right at home by the time they blossom in the spring. 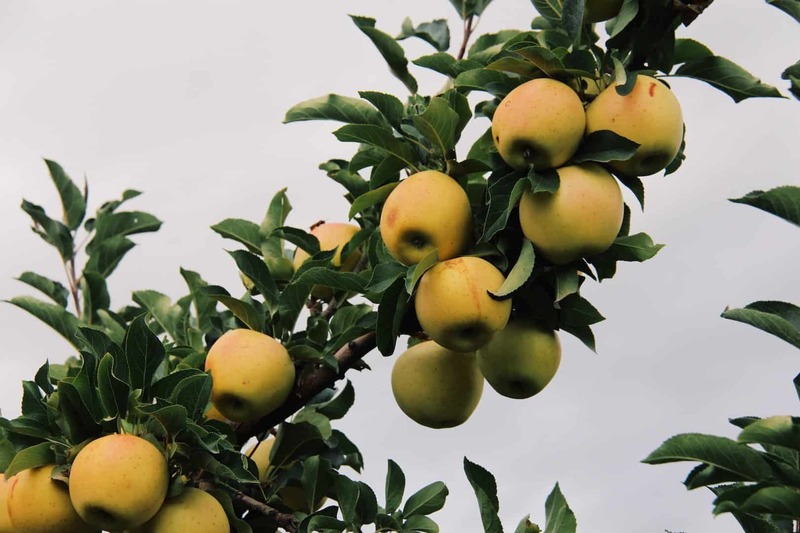 If you’d like to start growing organic apples, first take a look at your property to decide the best location for the trees. Pick an area of your yard that gets ample sunlight, preferably in the morning. You’ll also want to make sure this area is accessible for future apple picking. Keep in mind that you’ll need at least two trees of two different varieties to ensure cross-pollination. Take some measurements to bring along to the nursery with you. Once you’ve planned your planting area, head down to your local independent nursery for some trees. Talk over the available varieties with nursery staff. Pick two varieties that blossom at the same time to ensure good pollination. If local availability is limited, it’s also possible to buy apple trees online (here’s my take on what it’s like to buy trees online). Common, conventionally-grown trees like Red Delicious, Honeycrisp, and Fuji are available throughout the year from larger retailers while more unique varieties and certified organic trees may only be available in the shoulder seasons. If you can only fit one tree in your yard, you may be able to find a self-pollinating type. Alternatively, you might get away with a single tree if your neighbours also have trees. You may also consider planting dwarf or semi-dwarf varieties. These smaller trees make for an easier apple harvest (especially for children). Discuss your individual needs with the staff at your local independent nursery. They will know the specifics of your region, including the best varieties and other geographically-specific tips. 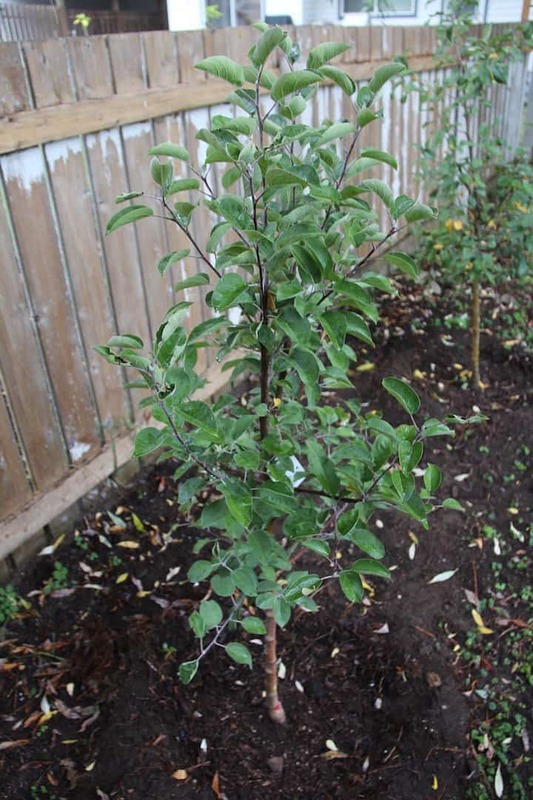 If you’re not into buying trees, it is possible to grow apple trees from seed. Growing apple trees from seed does not always produce delicious apples. In fact, the apples produced by a tree grown from seed will not be the same as the apple from which the seeds were collected. 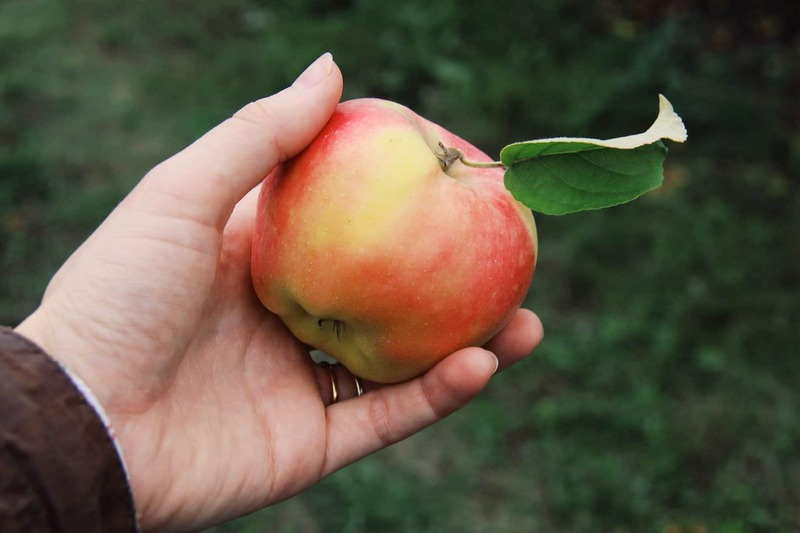 If you do decide to grow your own trees from seed, start with seeds you’ve collected from local organic apples that you thought were delicious. According to Paul Wheaton, there is about a 20% chance your new tree will produce delicious apples and a 60% chance that the tree will produce “ok” apples. They might be good for making juice, for making apple sauce, or even for pies. They’ll be ok for something. Unfortunately, there is a 20% chance that the tree will be a “spitter”. Spitter apple trees produce apples that are not good to eat. These apples can be used to feed livestock, or you can chop down the tree and make apple chips for smoking meats. I’m not sure how scientific these percentages are either. Growing organic apples from seed isn’t exactly standard practice. All the apple trees you see in nurseries and orchards are likely grafted. If you are a little adventurous and very patient, try these instructions for growing your own trees from seed. If you decide to buy trees rather than growing from seed, as I did, place the new trees in their containers close to their future homes on your property. Rotate the container around to find the most suitable orientation of the branches. Once you’re confident about the future homes for the trees, dig a hole for each tree. If you’re not sure about the location, you may want to observe the environment in your yard, try out a few areas, and find the best location for your trees. For dwarf varieties, plant the trees between 15 ft and 50 ft apart. Each hole should be quite wide (perhaps twice the size of the container in which the tree is delivered). Hole depth, however, should not be deeper than the tree’s container. Resist the urge to “improve” the hole by adding fertilizer. This will only encourage the tree to grow at exactly the time it needs to be going dormant for winter. Place each tree in the hole so that the soil in the container is at the same level as the surrounding ground. Backfill the hole with the existing soil and lightly tamp it down. Do not compact the soil excessively. Give the tree a thorough watering after planting. If you wish to feed the tree, a light mulch of compost can be applied on top of the soil after you’ve finished planting the tree. Ensure that no soil or mulch is touching the tree trunk. Soil and mulch should never touch the bark of any tree, as it invites moisture, bacteria, and rot. If you mulch the tree with shredded fall leaves for the winter, keep the same rule in mind. Mulch, of any kind, should never touch the bark of a tree. Don’t try to do too much to the tree before it goes dormant for winter. Fall is not the time to start pruning a newly-planted apple tree. Some instructions may call for fertilizer at this point, but that is not recommended. Beware that if you use chemical fertilizer to your apple tree, it won’t be organic anymore! Top dress the soil with a bit of compost in the spring if you must, but otherwise just make sure it has enough water and leave it to it’s own devices. In the winter or early spring, you can give the tree a light pruning if necessary. Remove any cross-branches (branches that go in odd directions) or dead/damaged/diseased parts of the tree. As you are working with a young tree which has been recently transplanted, be gentle with the pruning. Don’t remove too much of the tree in it’s first year. Your goal is only to improve air flow around individual branches by reduce branch crowding. You want the sun’s rays to reach into the centre of the tree, and want air to be able to circulate around each branch. If you are new to pruning, I recommend borrowing a copy of The Pruning Book, by Lee Reich, from your local library or friendly fruit enthusiast. Lee is a fruit-growing guru who is known for his scientifically-based yet easy-to-follow method of instruction. His book, Grow Fruit Naturally, is also an excellent resource if you find that pests are invading your trees. There are several methods of chemical-free, natural pest control suited to growing organic apples. Apple trees are truly gorgeous throughout the year. From the display of blossoms in the spring to the harvest of fruit in the fall, the apple tree is truly a showstopper in the yard. Once you’re ready to harvest, consider having a harvest dinner or fall picnic to celebrate the bounty you’ve earned. Apples can be harvested by gently turning each apple upside down so that the bottom is facing up to the sky. There is no need to twist or pull on the apple. It will come off the tree gently when inverted. Did you have a chance to go apple picking this year? If so, do you have any good apple orchards to recommend? Do you love growing organic apples? What about your favourite varieties? Let me know in the comments below. It might be time for me to add a few new types to our fruit walk!